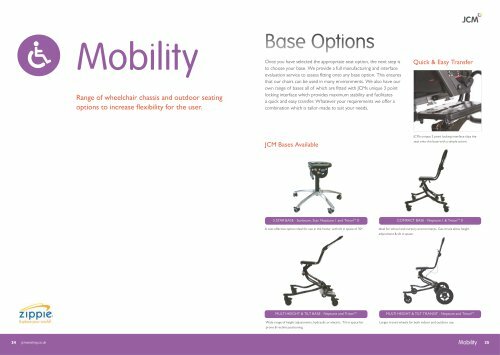 Mobility Range of wheelchair chassis and outdoor seating options to increase flexibility for the user. Base Options Once you have selected the appropriate seat option, the next step is to choose your base. We provide a full manufacturing and interface evaluation service to assess fitting onto any base option. This ensures that our chairs can be used in many environments. We also have our own range of bases all of which are fitted with JCMs unique 3 point locking interface which provides maximum stability and facilitates a quick and easy transfer. Whatever your requirements we offer a combination which is tailor-made to suit your needs. 5 STAR BASE - Sunbeam, Star, Neptune 1 and TritonTM 0 A cost effective option ideal for use in the home, with tilt in space of 30°. MULTI HEIGHT & TILT BASE - Neptune and TritonTM Wide range of height adjustments, hydraulic or electric. Tilt in space for prone & recline positioning. Quick & Easy Transfer JCMs unique 3 point locking interface clips the seat onto the base with a simple action. COMPACT BASE - Neptune 1 & TritonTM 0 Ideal for school and nursery environments. Gas struts allow height adjustment & tilt in space. MULTI HEIGHT & TILT TRANSIT - Neptune and TritonTM Larger transit wheels for both indoor and outdoor use.